Your theme features a full widgetized page template that allows you to add and order your homepage content however you would like. To create your homepage visit Pages > Add New. On the right side of your screen assign the Homepage Template in the Page Attributes area. Also note that there will be no need for you to fill the editor block as the content of the homepage will be completely replaced by a widget area. 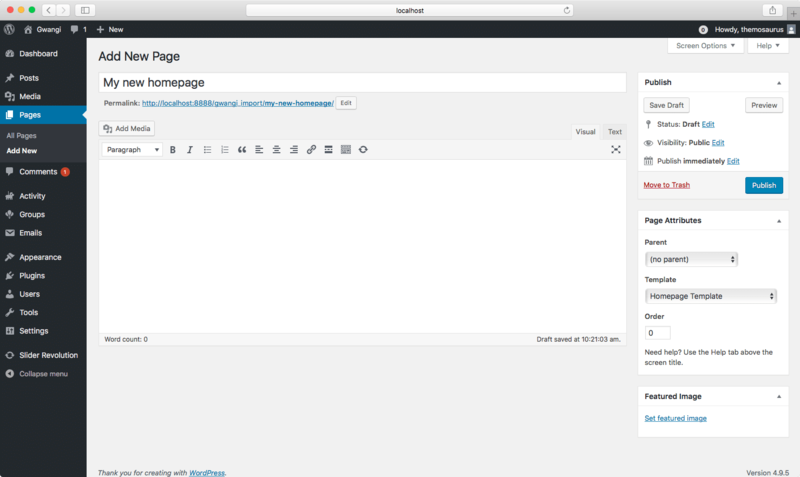 By default WordPress will load your latest blog posts on the front page of your website. To set your homepage template as the front page of your website, simply visit Settings > Reading and choose your newly created page as the Static Front Page. When activated, the Grimlock Hero plugin allows you to modify the Hero section of your front page through the Customizer. An wide range of options (title, subtitle, text, button, layout, typography, colors, background image, padding, etc.) is available to help you create the most impacting homepage header. Heads up! Create unlimited number of homepages using Easy Custom Sidebars! You can add more homepages to your website using the Easy Custom Sidebars plugin. It allows you to duplicate the Homepage widget area for other pages and by doing so, you will be able to add new widgets with a very different content. This plugin becomes really handy if you want to add multiple landing pages on your website.